We are apparitions alive, free to travel and explore. We are inside vehicles and sitting in drums. We are the solid sound of impact. We are energy allowed to express itself. We are instrumental people. We are reverberations, echos into the distance. 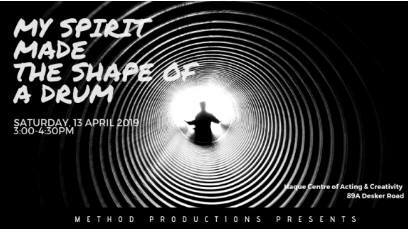 And My Spirit Made The Shape Of A Drum is a devised work created through an 8-session workshop process. Amirah Addin, Iqbal Rahman, Marylyn Tan, Venezia Lim and Wilson Goh explore how to tell a story using the performance vocabulary of poetry, movement, scene-work and image-making. Conceptualized and directed by poet and multidisciplinary artist Deborah Emmanuel.